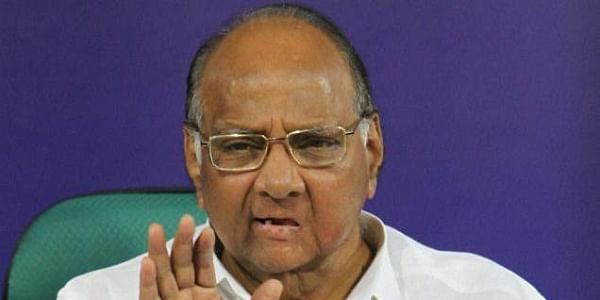 NCP chief Sharad Pawar said today that Narendra Modi should be ashamed of making such 'wild allegations' against Singh, whom 'no one in the world could point fingers at'. NAGPUR: Coming down heavily on the prime minister for alleging that his predecessor Manmohan Singh was conspiring with Pakistan for the BJP's defeat in Gujarat, NCP chief Sharad Pawar said today that Narendra Modi should be ashamed of making such "wild allegations" against Singh, whom "no one in the world could point fingers at". Senior Congress leader and Leader of Opposition in the Rajya Sabha Ghulam Nabi Azad also alleged that Modi has stooped to a low level and levelling allegations against the people of his own country. Pawar, who turned 77 today, addressed 'Jana Akrosh-Halla Bol', a public rally organised by the Congress and the NCP here on the issues of agrarian crisis. He appealed to the farmers in Maharashtra not to repay any loan or pay dues such as electricity bills to the state government unless it deposits the "much-touted" loan waiver amount into their bank accounts. Azad was also present at the rally. Pawar criticised Modi for "deliberately" misconstruing a meeting at the residence of suspended Congress leader Mani Shankar Aiyar on December 6 and presenting it as a conspiracy by Pakistan to interfere in the Gujarat assembly polls. "Shame on you, prime minister, for making such allegations! You have made the allegations against this country's former prime minister (Manmohan Singh) and former defence officials," Pawar, a former defence minister himself, said. Modi, while speaking at a poll rally in Gujarat on Sunday, had sought to link the dinner meeting hosted by Aiyar for Pakistani dignitaries and attended by Manmohan Singh, among others, with the ongoing Assembly polls and a conspiracy against the BJP. "Modi is invoking Pakistan and making wild allegations against renowned people to divert the people's attention from his government's failures and trying to get political mileage out of it," Pawar said. "A different kind of picture is being witnessed in the country today in terms of the attitude of the nation's leadership, which is diverting the attention of the people from important issues," he added. "Prime Minister Narendra Modi just two days back in his speech had raised the suspicion against former PM Manmohan Singh, former Rajya Sabha MP Mani Shankar Aiyar and others, alleging that Pakistan was trying to influence the Assembly elections in Gujarat. "The PM making such kind of wild allegations against former PM Manmohan Singh, at whom no one in the world could point fingers, is very shameful and not in the interest of the country. It is very sad that an attempt is being made by the PM himself on destroying the tradition of the country," the former Union minister said. "This attempt to invoke Pakistan was made to divert the people's attention towards the government's failures in addressing the farmers' issues, lack of jobs and other people's issues," Pawar alleged. "The Modi government has not solved the issues of farmers and other issues the country is facing, but he is bringing the Pakistan angle as a diversionary tactic during the Gujarat elections," Pawar said. Modi has destroyed the country and belittled the office of the prime minister, Pawar alleged. In his address, Azad said that since the BJP is losing in Gujarat, the prime minister is blaming his predecessor, former vice-president and former diplomats for conspiring with Pakistan to defeat the BJP in Gujarat. "The prime minister has stooped so low that he is levelling allegations against the people of his own country," he said. On the farmers' issues, Pawar said, "Unless the amount of loan waiver is deposited into the bank accounts of the farmers (in Maharashtra), I appeal to the farming community not to repay any dues (to state or cooperative department) or even (pay) electricity bills to the state government." The Maharashtra government announced a mega agriculture loan waiver of Rs 34,022 crore on June 24 after a state-wide agitation by farmers. On July 9, Chief Minister Devendra Fadnavis said around 36 lakh farmers in the state would have their entire debt waived. Pawar also asked Fadnavis to "stay away" from "politics of blackmail". The NCP supremo said, "Maharashtra CM uses the language of blackmail against the Opposition. We respect the mandate of people who chose you to govern. But, if he thinks blackmailing a part of the people's mandate to his government, he should remember that people can oust him from power." If the government is of no use to its people, they should not cooperate with it, he said. Speaking to reporters in Nagpur ahead of the winter session of the state legislature, which began on Monday, Fadnavis had said, "I have enough evidence against the leaders of the Opposition and I will disclose these at the right time." On the Centre's promises to farmers, Pawar said that Modi had promised loan waiver to the farmers, but there was no sign of relief to the farmers even after three-and-a-half years. "The situation is such that people are committing suicide, yet the government's heart is not melting," he said. "I remember that five years back, during the agrarian crisis, the then PM Manmohan Singh and I had immediately visited Yavatmal and Wardha to understand the problems faced by the farmers. Subsequently, in the next 15 days, Rs 70,000 crore loan waiver was announced by the then government. "We had announced the loan waiver and had told by what time it would be given to them. Today, the chief minister is telling that they are going to give loan waiver, but they are not giving it," Pawar said. Azad questioned Modi over the promises he had made to the farmers that the minimum support price (MSP) would include a profit of 50 per cent above the cost of production. "How can a PM of any country make such false promises to its people? How can a PM give false promises to its farmers and not fulfil it? The PM and the BJP, by insulting the farmers, have insulted the nation, which cannot be forgiven," Azad said. "On the one hand, the farmers in the country are facing an agrarian crisis and committing suicides and on the other hand this government imposes GST and demonetisation, forcing several crore people to stand in queues outside ATMs. "The PM had promised 10 crore jobs to the youth, but provided just 3 lakh jobs. This was the second lie from you...first giving it to farmers then to the youth. Modi is giving false promises to the farmers and the youth," the Congress veteran said. Azad also said that Modi hardly remains in office and is only busy in election campaigns and foreign tours.